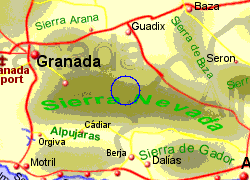 The Sierra Nevada National Park located in Granada province and extending into Almeria includes the highest peak in mainland Spain, the Mulhacen at 3,482m, higher than the Pyrenees, making themthe second highest in europe after the Alps (Spain is in-fact the second most mountainous country in Europe). The Sierra Nevada also claims to have a total of 15 peaks over 3,000m. 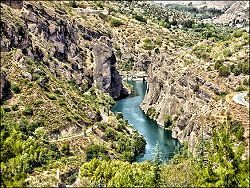 The slopes on the southern side is a particularly special area, the Alpujarras, which includes some fertile land, watered by meltwater from the sierras, and developed by the Moors. The park extends to 86,000Ha and includes a variety of terrains, peaks with snow for half the year, glacial lakes, scree slopes, deep gorges and more gentle land that can be grazed by sheep and goats. There are over 60 species of wild flowers that are exclusive to this area and you may also see Spanish Ibex and wildcats. 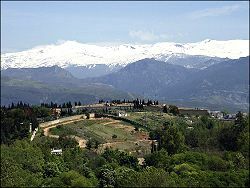 There is a ski resort Solynieve (translates to sun and snow) on the north western side, approached from Granada. Something unique about the Sierra Nevada is that it is possible in early spring, if you want, to ski in the morning and swim on the Costa Tropical in the afternoon. Pampaneira, Granada province, approximately 20 Km from the Granada - Motril motorway. Laujar de Andarax, Almeria province, on the southern edge of the sierra. 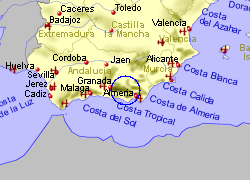 Bayárcal, Almeria province, on the southern edge of the sierra . 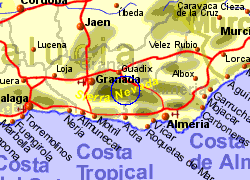 Map of the Sierra Nevada area.